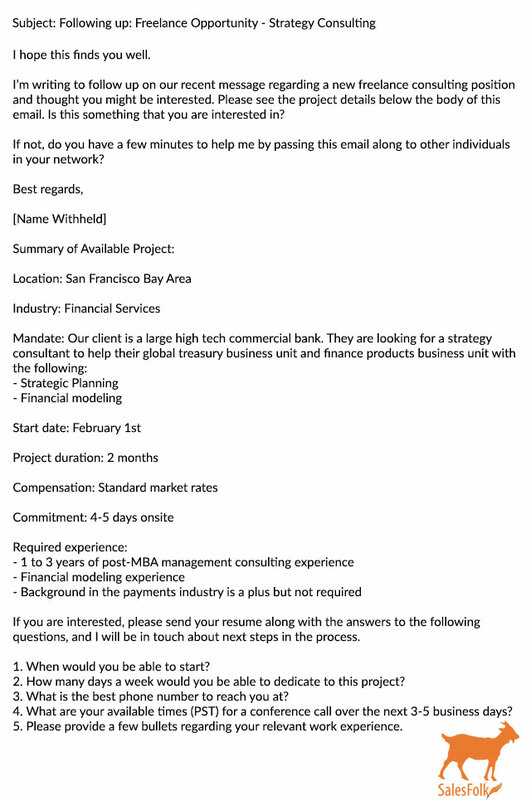 This is the cold email hall of shame for the worst prospecting emails. Vague, suspect messages. False compliments. A subject line that’s almost too absurd to seem real. These are just a few of the gems in this month’s roundup of shame-worthy emails. If I had to draw one thread connecting all five of these messages, it would be the dangers of spamming a huge list of poorly targeted leads with irrelevant emails, or sending emails that are so general they’ll apply to anyone (or no one). Where to begin? 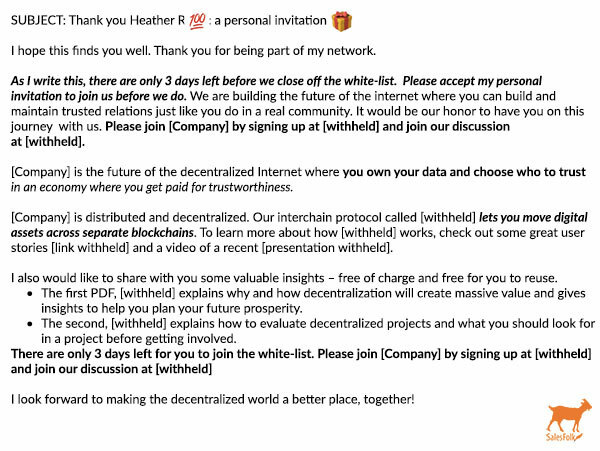 This is basically a marketing brochure the sender tried to turn into a sales email by tacking some empty pleasantries onto the beginning of the message. And that crime pales in comparison to the formatting issues here. After reading up on what this company does and seeing the business mentioned by reputable publications, I was somewhat intrigued. But I had to do a lot of my own work to get to that place. 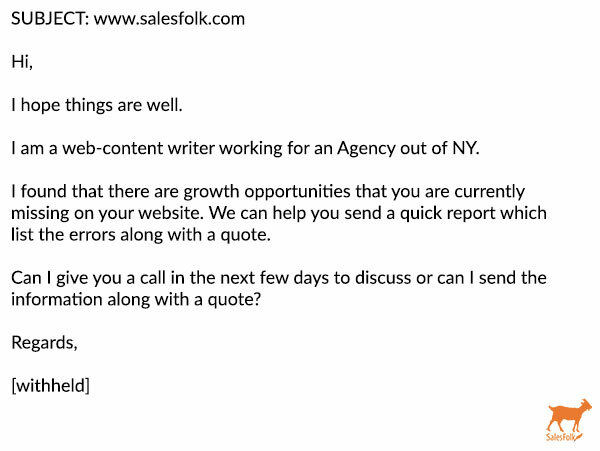 Here at SalesFolk, it’s our business to thoroughly examine cold email, but the average recipient wouldn’t even be able to get past the links, bold fonts, italicized fonts, bold-italicized fonts, and bullet-point lists. So this email is a really good example of how a compelling product, service, or company can get lost if the sender spends more time focusing on cosmetic adjustments to the text than on communicating benefits to recipients. Vague emails aren’t sketchy by definition, but in the case of this one, the lack of information definitely makes one raise an eyebrow: “an Agency,” “growth opportunities,” “errors.” Maybe I wouldn’t have questioned the legitimacy if I hadn’t Googled this company’s URL and gotten a Page Not Found with that little frowning face, not to mention an address that doesn’t actually have a building, according to Maps. And even if it is a legitimate email, it’s too vague to be enticing in any possible way. Moving on . . . 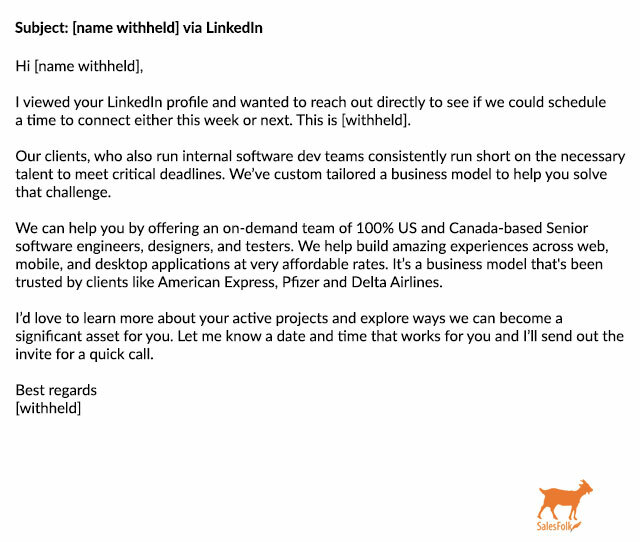 I know it’s normal that recruiters don’t always include the company name in their initial emails, but this message seems to be actively trying to not include any useful details. What size company is it? Where is the job located? What do you actually know about my previous experience that’s led you to reach out? When a sender withholds as many details as they’ve done here, it’s practically impossible to get excited about the message. 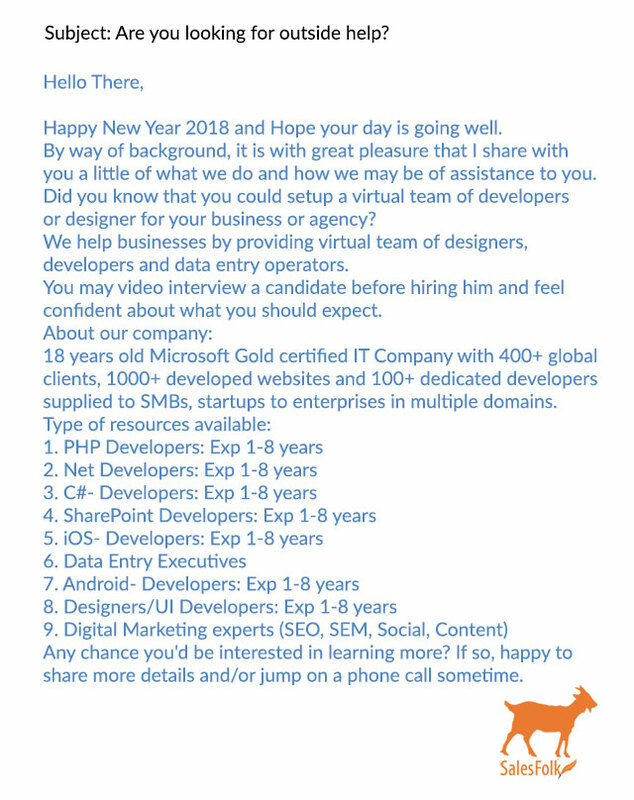 After all, it’s hard to imagine yourself fitting in at a company that needs “various C-level positions.” My guess is that this is a mass, un-researched list sent by someone looking to fill a quota. Unfortunately, that tactic rarely gets responses. 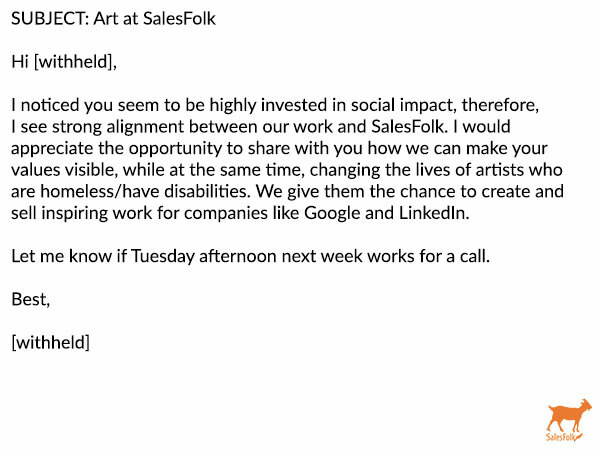 The false tone continues throughout the rest of the email with phrases like “make your values visible” and “changing the lives of artists.” No one talks that way in a real conversation. This email is pure performance. Crimes: that subject line . . . Yes, that subject line is real. And yes, it was probably a mistake, which is yet another lesson in why proofreading is so important for cold email. The Slacker shows up in some form almost every time we do this roundup. This time, it’s another case of marketing emails parading as sales messages. In other words, we didn’t opt into this email. More importantly, this highly un-targeted email tells me nothing about this event—what I’ll learn, why the topic is important. 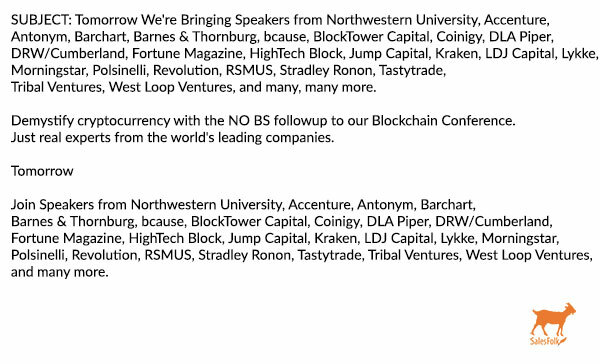 It’s just a list of speaker names, which the sender already included in the world’s longest subject line ever. Never assume a recipient has seen previous emails sent. There are dozens of reasons why they may not have, so it’s best to make every email in a campaign tell it’s own complete story with all the necessary details. 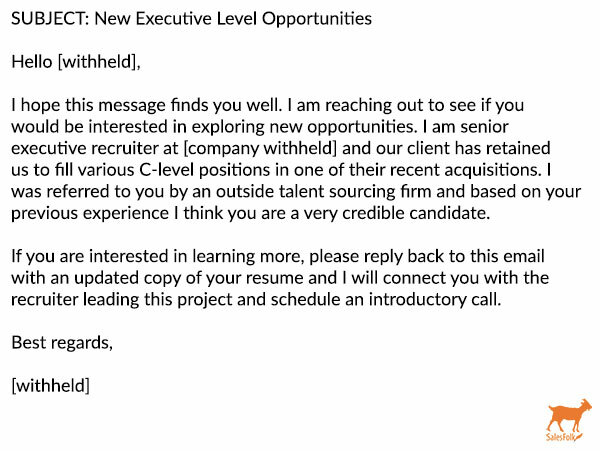 Even companies with established reputations and Fortune 500 clients have to learn the craft of sending a good cold email—and be wary of the bad ones. I’m a big fan of ClearSlide’s sales automation tools, which is what makes this email so disappointing. Its generic nature leaves a terrible first impression on readers and damages the sender’s reputation in the process. The message is also filled with phrases that mean nothing and offer no value to me. And while many wouldn’t read past the subject line, I delve into the specifics here because, start to finish, this is a great example of how unappealing and forgettable a message can become in such a vague email. 1. The subject line is forgettable. The subject “ClearSlide and your goals” fails to use basic tactics for subject lines, which is to appeal to people’s wants, needs, or fears about their business. “Your goals” could apply to my business, but it could just as easily go to a software developer or a coffee bean wholesaler. Such a lack of focus makes the subject line far from enticing, and any prospect, regardless of their profession, will likely glaze over this. ClearSlide has plenty of different features that they could easily turn into exciting benefits that would make their subject line pop. 2. The opening line is cryptic. The opener makes me wonder whether ClearSlide is being intentionally cryptic or if the sender is just plain lazy. “Stay professionally top of mind” isn’t even a cliche; it’s a bunch of words flung together that collectively have no meaning. 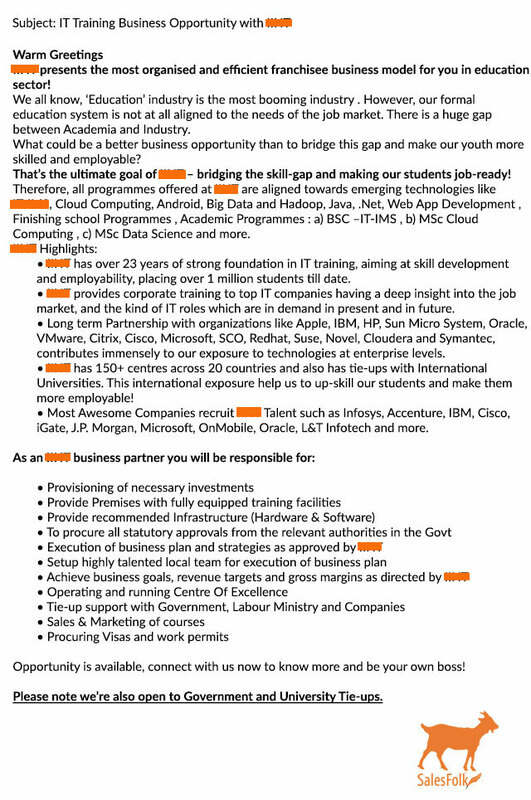 And “help you in being responsible for all key business initiatives” is also vague and confusing. Key initiatives mean different things to different roles. Mine will not be the same as the coffee bean seller, and it’s a huge turnoff when the email doesn’t make that distinction. 3. The sender didn’t research me or my business. As far as the rest of this email goes, there’s nothing in here that tells me the problems ClearSlide solves or what benefits the service could give—to me or anyone else getting the message. The email tries, by explaining that ClearSlide helped other companies “engage with the right content at the right time.” That said, the message fails to tell us what the result of that engagement was, which makes the entire sentence pretty pointless. And how does the sender even know if I even care about content? They don’t, and it’s clear they took no time to research me or my company before sending this email. 4. The call to action wants me to do extra work. This would be a perfectly fine CTA had the sender left out the second sentence. When you aren’t 100 percent sure who the correct person for your pitch is, go back and do more research. Asking me to supply the person feels like extra work. It’s especially discourteous when the email is so vague it’s impossible for the recipient to know who the right person would be. 5. Bonus: The included GIF is distracting and borderline unprofessional. 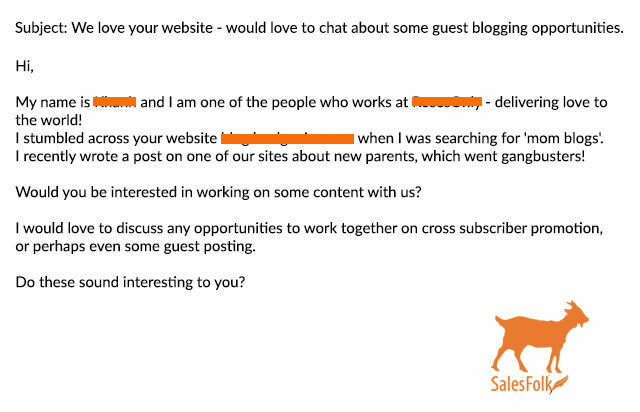 The animated GIF (you can only see a still here) included in this email is a huge no-no for cold email. It’s distracting, and it immediately indicates a mass-marketing email. 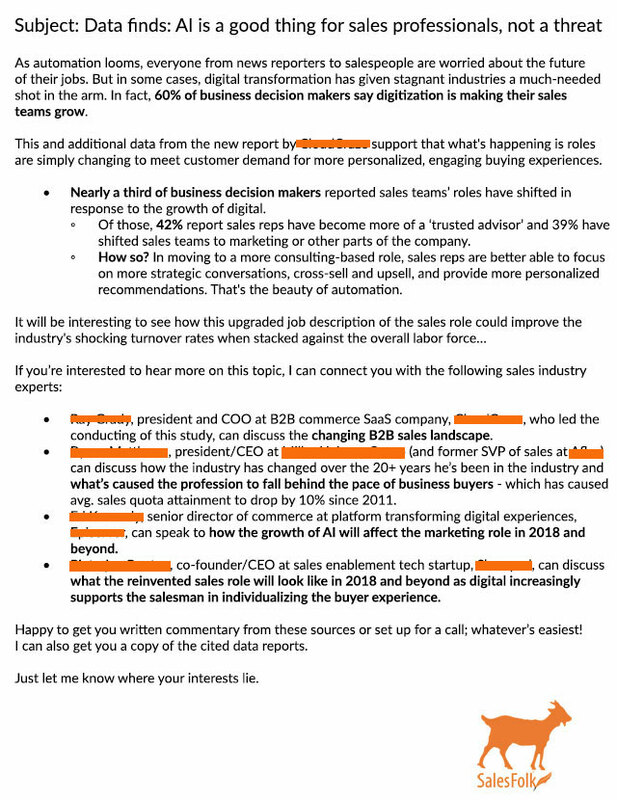 I may have taken the time to read through and dissect this email, but that’s part of what we do at SalesFolk. Most recipients would take on look at the GIF and delete the entire message without so much as a second glance. If you want to start a meaningful conversation over cold email, you have to give the recipient a really good reason to hit the respond button. In other words, you need to start a conversation to which they can actually contribute. Whether it’s highlighting a benefit you know the other person will need or posing a question they won’t read elsewhere, an effective message is all about the potential client and building a relationship with them. There are a number of mistakes littering this email, but three in particular illustrate just how unlikely it is this message will start a meaningful conversation. Let’s take a look at what went wrong and what can be done to to fix the mistakes. 1. The subject lacks any real information. At first I thought I read the subject line wrong; it’s just the sender’s name and a reference to LinkedIn. Unfortunately, it seems this tactic was intentional. A subject line is the first impression you make with the recipient. It’s the point at which they decide whether to open your email and keep reading or trash the message altogether. Simply stating your name could work if you’re a household name (“Taylor Swift via LinkedIn”). Since most of us aren’t, though, the person on the other end of the email won’t have any idea of who you are, making this approach to subject lines completely ineffective. The Fix: Lure the reader in with a benefit or interesting question. For example, a line like “recapture the deal you lost” is intriguing enough to pique someone’s interest but mysterious enough to make them want more. This ups the chances your email will stand out in a crowded inbox and that the recipient will open it. 2. The email is too self-focused. Focusing on yourself rather than the reader is one of the worst blunders you can make in a cold email. Every paragraph of this sender’s email begins in first person, making them seem more concerned with promoting their business than solving the recipient’s pain points or learning more about them. Not only is this a huge turnoff, it also suggests you don’t understand or care about the other person’s business. The Fix: Focus on aspects of your product or company the reader will find useful. They’ll be more likely to trust and engage with you when they see it’s not a one-sided conversation. A good copywriting trick is to always write in the second person, as it will help both you and the reader feel like you’re engaged in a two-way dialogue. 3. A lack of personalization makes the message boring. To be successful, every sales email needs personalization—tailoring an email specifically towards a particular person or role. It makes the email more enticing to the recipient and also also signals that you’re familiar with that person’s business, or, at the very least, that you’ve done your research. This email contains pretty much zero personalization. Sure, the sender included some tactics that could possibly benefit the reader, such as offering an on-demand team of software engineers. But that’s an overly broad benefit any number of potential clients could benefit from. Everyone needs on-demand software engineers these days, after all. There’s only one place benefits like these go: straight to the trash bin. The Fix: Include details that are relevant to the recipient. That might include a known pain point or some recent industry news that will impact them. At the very least, this sender could have mentioned a post the recipient recently shared. Putting your reader at ease with these kinds of details is the simplest way to entice them and get them to respond. Here’s a glaringly obvious fact about cold sales emails: they are not hard to write. Running a marathon is hard. Performing open-heart surgery is hard. Taking the time to research a prospective client and send them an email full of useful details is not hard. So including clues—intentionally or not—that tell a prospect they’re part of an arbitrary mass list makes you look lazy and untrustworthy, and won’t help your response rate. Let’s take a look at what went wrong and how this company could fix their future messages. 1. The recipient has to do all the work. 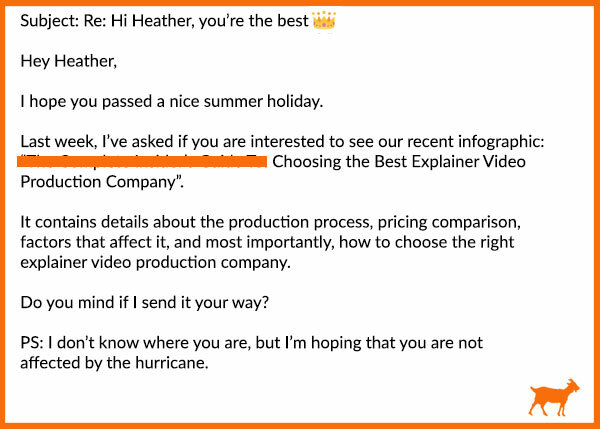 The first strike here is that instead of providing an explanation about what an “explainer video production company” is, the sender merely references a previously sent email. Maybe that message included an explanation; maybe it didn’t. The point is, the sender wants the recipient to go to the trouble of searching for that initial email, which is more work than you should ever make a prospective customer do. Why? Because referencing an old email doesn’t count as an explanation—you can’t assume that the recipient saw any of your previous messages. Each email should be unique, with wording and benefits the recipient will relate to. Messages that need to be decoded almost never entice people. 2. The sender openly admits to doing no research. Not knowing someone’s location underscores the fact that you didn’t research your prospective customers and that this message is part of a mass list. In the case of this email, it’s also callous. The message basically says, “I would love to sell you something even if your life was just severely impacted by a natural disaster.” I probably wouldn’t respond to this message on principle, even if it applied to my business. Instead, the sender should have checked their recipients’ locations and adjusted the message going to those impacted by the recent hurricanes. 3. The sender relies way too much on filler text. Finally, there’s that smiley face at the end. I realize a lot of folks believe it can set a pleasant tone for the end of the email. 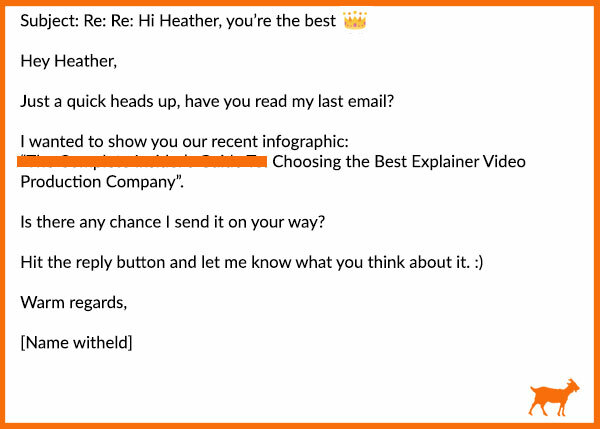 As a salesperson, you should never rely on emoticons to set the mood of your emails. Your time would be way better spent brushing up on basic copywriting skills. Read any bad cold emails lately? Send them to [email protected] for consideration, and we might include them in our next Hall of Shame post.